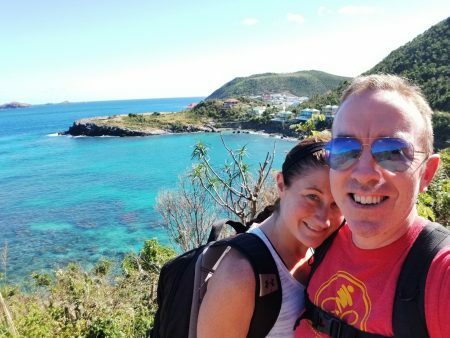 Today’s blog is written my client, Rich Payne who, along with his wife, had never been to St. Barth before and decided to try vacationing here. He’s hooked! I am sure you will enjoy it. Like any good story, this one starts off with tragedy. The dual storms of Irma and Maria set our course for St. Barth, though we didn’t know it at the time. My wife and I live in New York, just outside of sleepy Manhattan. I was lucky enough to have been brought as a child to the Virgin Islands back in the 80’s. I still remember the sunburns and crazy open sided “taxis” that always seemed to drive too close to the edge of a cliff. Not much has changed, with regard to those taxis – or sunburns. For the last 5 years, the wife and I have taken a trip to St Thomas each New Year’s Day for a week. Our annual sojourn was demolished by the terrible storms that need not be rehashed here…but to say that our hearts still break for the devastation and the lives lost. Try as I did to find a way to return to STT for New Year’s Day 2018, it was simply not in the cards. With no direct flights, and most villas (those that survived) still on generator power, we would almost be more in the way of active recovery than would be helpful. Another time. The wife decided, upon hearing me list the Caribbean islands with minimal storm damage, St. Barth’s was it. I had heard of this island, but only in passing. I also quickly became aware of its different spellings…was it St. Bart, St. Barth, St. Bart’s, St. Barth’s, or perhaps Saint Barthélemy? Where were we going?!? Next on my personal agenda, was where to stay. Here is where we find the hero of our tale, Peg Walsh. But first…how is the snorkeling in St. Barth? For that, I turned to my trusted google. I came upon my first article that mentions snorkeling and St. Barth, written in Condé Nast Traveler circa 2013. 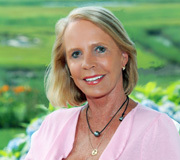 Whereupon I find a nifty quote by Peg, and proceed to google her to see who this guru of St. Barth really is. Guru, as it turns out, is apt. The rest, as they say, is history. I found our villa, and our island. What is not to love about beautiful SBH? The beaches, pristine, and hardly populated. The weather, a near perfect 82 Fahrenheit in the day, and brisk 72 Fahrenheit in the evenings. The food…French, and excellent (synonymous, perhaps?). Our villa, Brume de Mer, at the very westerly end of Flamands – perfectly secluded and overlooking Île Chevreau. We could not have asked nor wanted for more. Perhaps I am an over communicator. I am fearful to even look at all the emails I may have sent Peg in the lead-up to our arrival. I had questions, I don’t speak French, I have no Euros, do I drive on the left, is the steering wheel on the right, is it a boot, or a trunk? I can go on. Peg withstood it all, and her team as well. Quite literally from the time we stepped of Tradewind at SBH we had to think or plan for nothing. Reservations, done. Excursions, booked. Ideas for what to do and when, here’s your list. Personal concierge for “any hour” phone calls, yup. Thank you is not enough, Aurélie!! 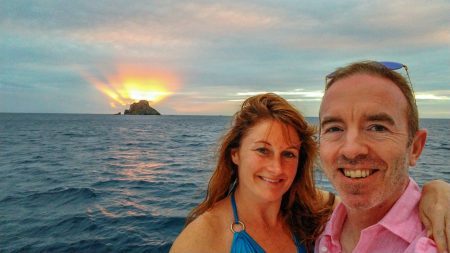 We enjoyed a sunset champagne cruise by Pain de Sucre, a Scuba diving spot. Peg helped us with everything. Obviously, her years of practice with novice visitors like us have allowed her to build this particular skillset. 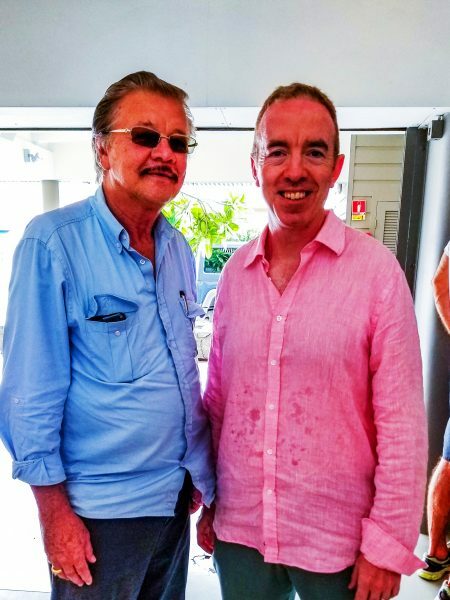 What Peg knew and that I would soon learn was that St. Barth Properties would take care of every little detail, and all we needed to do was show up. Onto what we experienced. Kindness and patience like we have not recently experienced on any vacation. I can count on one hand how many times I heard a horn blow…people stop in the street for any length of time….and, well, you wait. Quietly. 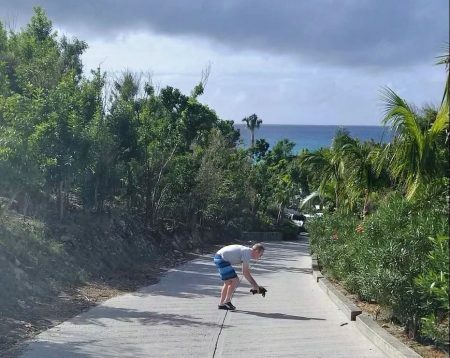 I watched a man hop out of his car in the middle of the day, holding up all sorts of cars in both directions…I quickly saw that he ran in front of his car to pick up a… tortoise? I had tortoise envy instantly. I was not to be outdone. One day heading down to Gouverneur we came across a tortoise in the middle of that narrow drive down. (S)he probably would have made it across ok, but I needed to do my part…I hopped out of the car and gently picked her/him up, and safely delivered (it) to the other side of the road. The wife filmed this particular event. Late for your dinner reservation? Take your time. We are waiting for you. Say what?!? In New York, you could just as well kiss your table goodbye if you are even a few minutes late. Not here. In fact, take all the time you need. We loved having dinner at Le Tamarin. Not speaking the native language always bothers my wife and me. We honestly feel terrible. I tried my best at “Excusez-moi, Je ne parle pas français” and “parlez vous anglais” but we always felt like we should do better. Fortunately, everyone who did speak French couldn’t have been nicer…and immediately switched to English, much to our relief. Lil Rock Beach Bar entertained us with live music. Mornings were spent at Yoga for the wife, and I walked through Gustavia. We then enjoyed a particular boulangerie for 6 straight mornings…simply the best. Each day was a new beach, Flamands, St. Jean, Gouverneur, Saline, Shell, Colombier. The ones we didn’t get to visit this time, we at least saw when we drove around the entire island. What we can appreciate is that there is so much more to see and experience on your beautiful island that it would be folly to try and do it all in 7 days. We hiked along a goat path from our villa Brume de Mer to beautiful Colombier Beach. One of the main takeaways from this trip for us will be the kindness shown to us by strangers – all the local islanders and business owners who just recently lived through a trauma we can only imagine, and here you all are with smiles and warmth all around. What resilience! I could easily name the names of the places we ate at and loved so much…but what’s the point, they are all spectacular, and surely you all know that already. I could also name the names of the people we only read about or see on TV…but what’s the point, you see them all the time…they’re neighbors and friends to you, so we will remain silent on that as well. I must say, on our last day…I decided that there was one person on SBH I felt I needed to “bump into.” I knew it was a long shot. I found an email address online after some googling. I wrote a heartfelt note – with a little of my background for color. I left my email address and cell phone number…not that I thought my cellular network would even work down here. Sure enough, about an hour and a half later…my cell phone rings, and on the other line was Bruno Magras, Président du Conseil territorial de Saint-Barthélemy. I was speechless. Not only did he call me back, but he also agreed to meet me for a photograph! I have read enough about SBH to know that, like politics all around the world, perhaps not everyone is in awe of Le Président. I was happy as could be to meet this man. He, like the rest of the folks we encountered on SBH, was genuinely warm and gracious. Le Président of the COM, Bruno Magras, kindly agreed to meet me. I asked Peg if she would allow me the privilege of writing this guest blog…selfishly of course, I wanted a way to memorialize our wonderful 10-year anniversary, and I could think of no better way. 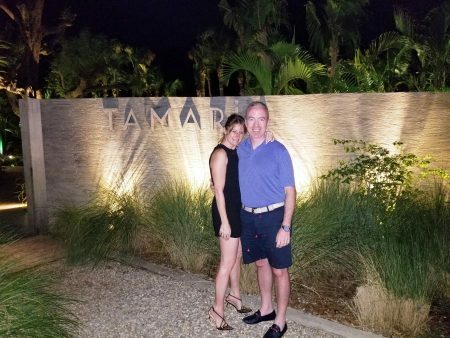 Peg and St. Barth Properties truly helped us celebrate our 10 years like no other place could. Thank you! You have a special island, worth protecting. We were lucky to catch a glimpse of the magic that is Saint Barthélemy. This entry was posted on Tuesday, February 13th, 2018 at 10:10 am	and is filed under St. Barth Trips. You can follow any responses to this entry through the RSS 2.0 feed. You can leave a response, or trackback from your own site. Looking forward to seeing Nirvana on 2/26 while in port on Windstar Pride for the day, Doug’s day. That is the best report I have ever read! The part about Bruno is hysterical! I read this entire report out loud to my husband, and we had a great laugh. Imagine if Rich had seen the island before the storms! Hope he comes back to see how glorious it can be! I have come to rely on Pegs blog to give updates on the island since the Storms. We are returning for the third time and have loved it so much we are bringing our (adult) children with us. 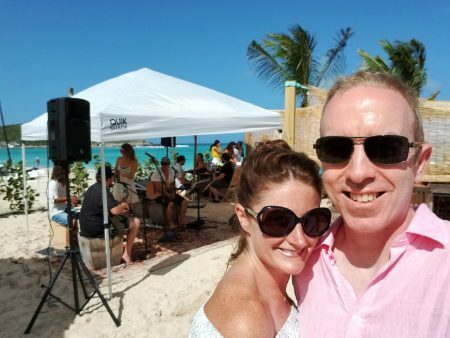 I keep checking on re-openings – not just for tourist reasons – we came to enjoy so many people that worked at the beach bars and our hotel that we were worried about them. thanks for the guest blog!